Housing charity Shelter has more details. Under the initial proposals, a room used for foster children or kept free for a member of the armed forces serving abroad was classed as a spare room, but Iain Duncan Smith has backed down on this area following extensive backlash. But research published by the National Housing Federation shows how inadequate this support is. Were the £30m discretionary fund to be distributed equally among every claimant of Disability Living Allowance affected (229,803 in total), they would each receive just £2.51 per week, compared to the average weekly loss in housing benefit of £14. Around a third of social housing tenants have a “spare” room, and will now have to pay an average of £700 more per year or move out of their homes. Yet there are insufficient numbers of social houses with the “correct” number of bedrooms due to the failure of successive governments to invest in housing, and downsizing isn’t possible anyway for some disabled people, particularly those who use wheelchairs. As Left Food Forward highlights, this policy may very well lead to homelessness and overcrowding, and will undoubtedly put even greater financial strain on people who are already struggling. And as Polly Toynbee points out, it is likely to end up costing the state more in the long run anyway, rather than saving money. The bedroom tax is yet another example of the government’s agenda to protect and enhance the wealth and privilege of those at the top of society by attacking and demonising those at the bottom. The cuts are not necessary. There is sufficient money out there to ensure that everyone’s basic needs can be met, yet Cameron and his friends would rather dismantle the welfare state and blame individuals than tackle the structural inequalities that lead to poverty and force the rich to pay their fair share. It is absolutely obscene that a government of millionaires with multiple properties and god knows how many “spare” rooms between them plan to claw back essential living space from disabled people and children, or make them pay the price. There are over 50 protests against the bedroom tax taking place across the country tomorrow. Find your nearest one here and go make some noise! 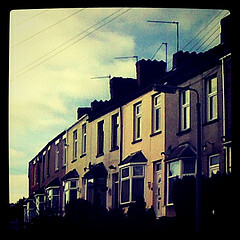 Photo of a row of terraced houses by Liz Plummer, shared under a Creative Commons licence. If everyone living in taxpayer subsidised accommodation is entitled to a spare bedroom, why not the rest of the population? I live a street consisting of small owner occupied terraced houses. I imagine half the residents don’t have a spare bedroom – certainly I don’t. Can I have a spare bedroom paid for by the taxpayer please? Hi Ralph. The problem is that there are nowhere near enough social houses for people who don’t need the spare bedroom they have to downsize to. They are therefore being penalised for successive governments’ failure to invest in building social housing, and the Thatcher government’s decision to let council tenants buy their houses, which depleted the pool of available accommodation. Plus, as I mentioned in the post, many of these so-called “spare” rooms are actually very much needed. So I suggest you direct your irritation at the government, not at the people who are being attacked by them. How many spare bedrooms has say, Windsor Castle have ? Buck Palace ???? 10 Downing Street ???? 11 Downing Street may have a few ???? What about those lovely large houses in Belgravia, Kensington and Richmond ???? Yet again this government want to hit the poor and needy because there the easy targets. I cant see how penalising someone who has a spare bedroom will reduce the huge deficit ? I read that it will be £14 reduction in benefits for one spare room. Now, £14 may not sound a lot, but to someone who needs it to pay food, fuel, heating, clothing etc , it does. This can only lead one way ….the poorer getting poorer. are your voters , why are you silent in stopping this ?????? ?